궁중에서 큰 예식이나 혼례식에 입었던 왕비의 원삼이다. 원삼이란 황후와 왕비, 빈들이 입었던 예복이다. 이 원삼은 황색의 금직단에 붉은색으로 안을 넣고 그 둘레를 남색으로 선을 둘렀다. 소매 끝에는 다홍색과 남색의 색동과 금직단으로 만든 한삼을 달았다. 황색의 금직단에는 ‘백수(百壽) ’, ‘백복(百福) ’, ‘다남(多男) ’등의 글씨무늬가 있는데 소매와 길의 위아래에도 같은 문양이 금실로 짜여져 있다. 황후의 표식으로 가슴에 흉배를 달고 양쪽 어깨에도 보를 달았는데, 이것은 원삼의 바탕색과 같은 노랑색 바탕의 둥근 원으로 만들어져 있다. 안에는 5개의 발톱을 가진 용을 금실로 수놓고 둘레는 오색의 구름을 수 놓았다. 보통 왕비의 색은 홍색인데, 원삼이 황색으로 되어있는 것은 고종 33년(1897) 대한제국 선포후 왕이 황제로 승격됨에 따라 왕비를 황후라 하고 원삼도 황후의 황색을 착용하게 되었다. 전 황후 황원삼은 대례복으로 전해오는 유물들 가운데 우리나라에 소장된 것으로는 유일한 예로써 그 가치가 높다. 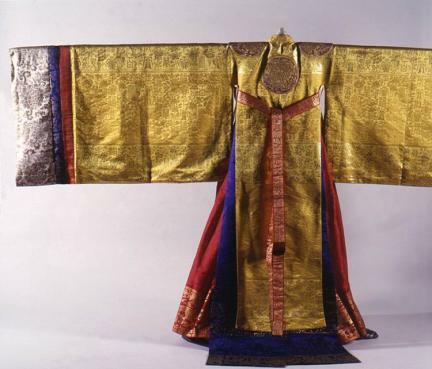 This ceremonial robe or wonsam was worn by the Queen during a national ceremony or a wedding at the royal court. 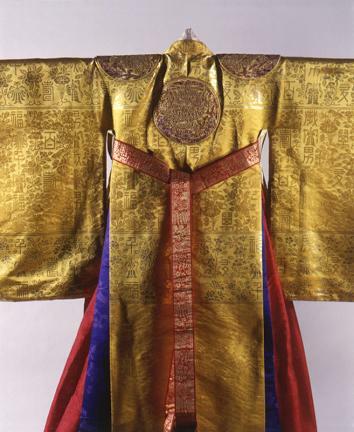 Wonsam was worn by empresses and queens and royal concubines. 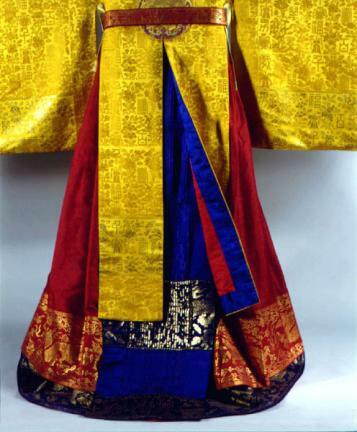 This particular wonsam is made of geumjikdan (cloth woven with gold threads), and it has red lining bordered with deep blue line. Crimson red and navy blue saekdong (cloth of stripes of many colors) and hansam made of geumjikdan are attached at the end of the sleeves. 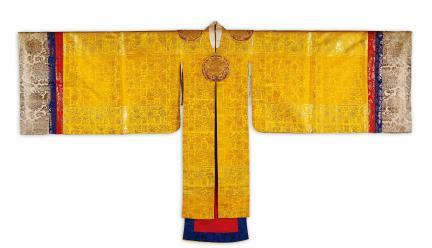 Patterns of propitious letters wishing for longevity, prosperity, and many sons are embroidered on the golden geumjikdan. The same patterns are embroidered with gold threads on the sleeves as well as on the upper and bottom of the dress. 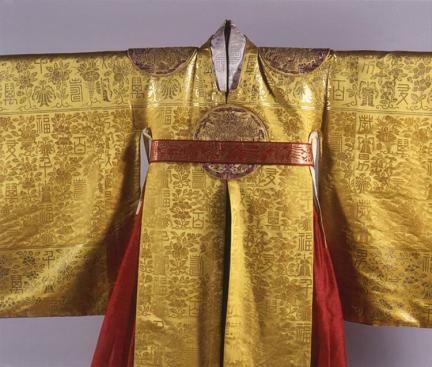 As a symbol of the Empress, a hyungbae (embroidered emblem at the back and chest of jackets or dresses) and a bo are attached on the chest and both shoulder areas, respectively. They are round and made of yellow cloth as the background color of this dress. 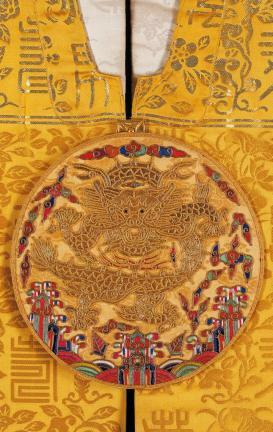 Inside the attachments, the pattern of a dragon with five claws is embroidered with gold threads; the pattern of clouds is embroidered in five colors around the dragon pattern. The Queen's wonsam is usually red, but this wonsam is yellow. 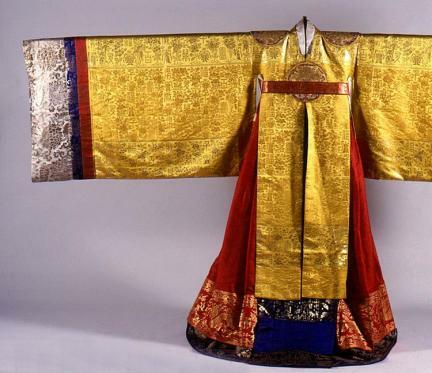 This wonsam is presumed to have been made after the King was upgraded to the status of Emperor in the 33rd year of the reign of King Gojong, and the Queen, to Empress. Accordingly, the use of yellow color in the making of wonsam for the Empress has been allowed since then. 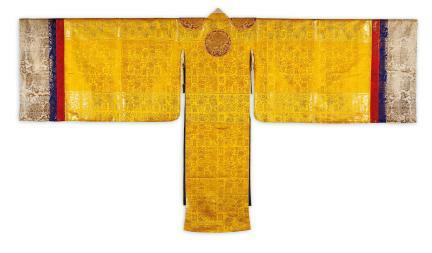 This golden wonsam for an Empress is the only one remaining today, so it is considered very valuable.